Architecture club is one of the newest clubs to appear at Roosevelt High School. It was started by Club president Faith Feliciano and vice president Paola Leal with the help of sponsor architecture teacher Katy Philbrick. Philbrick has been teaching architecture for the past 11 years. Members of architecture club at the October meeting. It was Feliciano and Leal that started to take the lead. Their hard work and dedication to starting an architecture club helped to finally turn Philbrick’s idea into reality. The first meeting for the club was held on Sept. 26 in which 11 students attended. At the meeting they went over the calendar for the upcoming months which included events like “Barkitecture,” where local architecture students make dogs houses in order to support local pet rescue and adoption non-profit organizations, different seasonal activities for holidays, and more. The club meets every other Wednesday in E208, and have been planning more events. 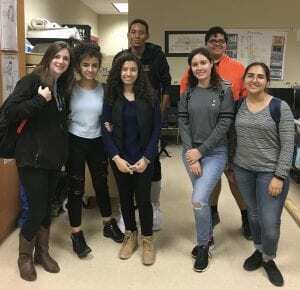 They hope hosting different craft-centered events at both B and C lunches, a gingerbread house competition this December, and more events that will be determined by voting at upcoming meetings.